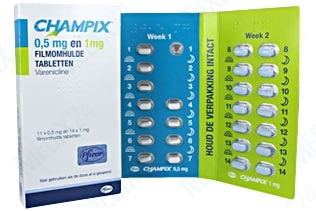 Champix ® is the world‘s most successful drug for tobacco smoking cessation. As per patient surveys, the drug was rated with over 80% effectiveness and over 70% recommendation. 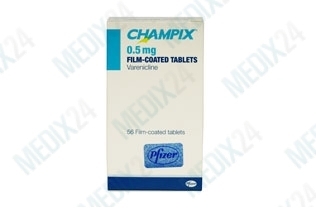 Champix contains the active ingredient Vareniclin and is manufactured by Pfizer. This medicine contains the active ingredient Varenicline that supports adults to stop smoking. The active ingredient Vareniclin settles down the body‘s receptors. By using Varenicline, the desire of the body for nicotine as well as the occurring of withdrawal syndromes can be avoided. A course of Champix will take 12 weeks to complete and many people find this is long enough for them to effectively stop smoking. Others might op for a second 12 week term. Champix can have a low to moderate influence on the ability to drive and to use machines, for example causing vertigo or drowsiness. The medicine must not be taken during pregnancy. It also should be stopped during the lactation period. When you are hypersensitive for the substance Vareniclin or another ingredient, you may not use Champix. If you suffer from great agitation, states of disturbance, depression or behavioral changes, discontinue using Champix immediately. Experience has shown that taking the medicine Champix can cause depression and danger of suicide. If you already suffer a psychiatric disease, the de-habituation of smoking may deteriorate the symptoms with and without taking drugs. There are no records reported on use of champix with patients that suffer from epilepsy. After treatment of Champix is discontinued, this can increase irritability, depression, insomnia and/ or desire for smoking. If one of these phenomena occurs, a doctor has to be consulted. Under certain circumstances it is advisable to discontinue the dosage, not immediately, but instead to decrease gradually. 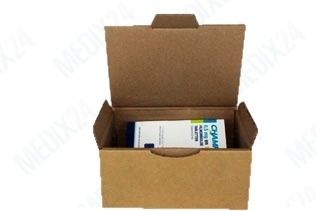 The most significant known side effects of Champix are listed here. Each patient reacts differently to certain drugs. Therefore, side effects do not necessarily occur. Once in a while allergic reactions occur in response to medicines. If you notice any signs of an allergic reaction, consult your doctor or pharmacy. It was observed that some patients taking champix may show signs of depression, suicidal thoughts and/ or changes in behavior, such as aggressiveness and unreasonable behavior. Moreover, there is data on the occurrence of hallucinations, heart attacks, swelling of the face and other hypersensitive reactions. As warned above, please consult your doctor when you think you might be suffering from these symptoms. So far there are no records or knowledge about interactions with other medications. Patients that suffer from severe kidney malfunction should avoid a simultaneous intake of Vareniclin (Champix) and medicines that inhibit the histamine production of stomach acid like Cimetidin, as it is used for the treatment of heartburn. The blood pressure may be reduced if Champix is used simultaneously with a nicotine patch. The result of this is a higher probability for any possible side effect such as headache, nausea, dizziness, vomiting, digestion complaints and fatigue.